Finish: Slowly lower the dumbbell by bending your elbows to a 90 degree angle, then push back to starting position. holding the dumbbell should be parallel to the ground and bent at a 90 degree angle. your upper arm parallel to the ground throughout the entire motion of the exercise. Only the elbow should be bending,and no movement should come from the shoulder. 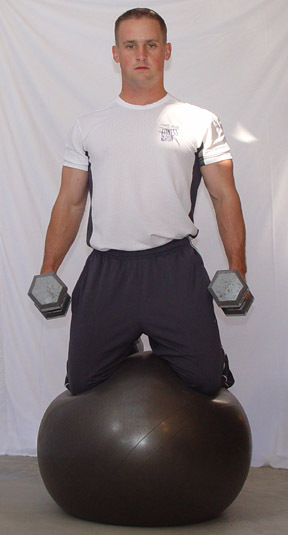 your knees about shoulder width apart (this will make it easier to stay on the ball). Finish: Curl your hands up by bending your elbows and contracting your biceps muscles. tight the entire time in order to keep your balance.